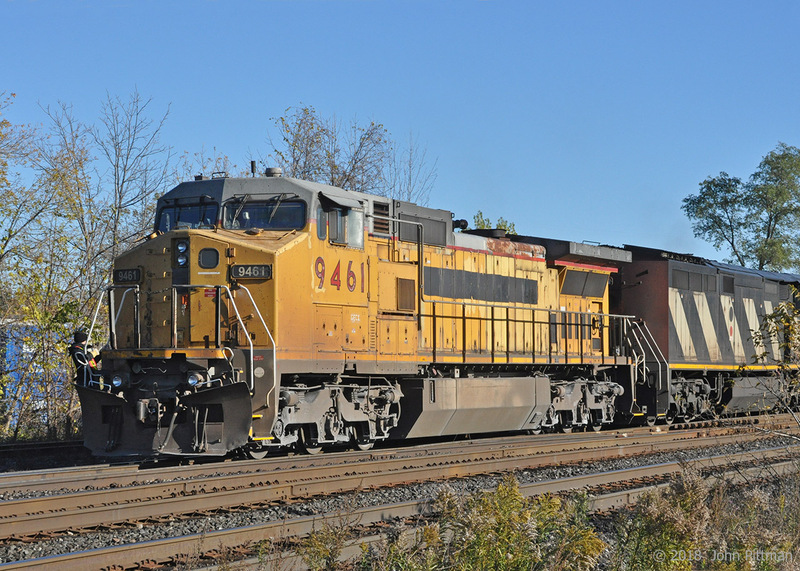 Railpictures.ca - John Pittman Photo: The locomotives from train 384 have left the train to lift cars in Aldershot Yard, making unobstructed views of GECX 9461 possible briefly (GE Dash 8-40CW, ex-UP 9461). The leaser was in front while reversing into the yard at Aldershot East, though control of all 4 units remained in original lead unit CN 8830 (GMD SD70M-2). I preferred King Road grade crossing which used to run through the middle of CN Aldershot East, because it gave better access for photography. But no doubt local motorists like the current underpass better, as does CN. | Railpictures.ca – Canadian Railway Photography – photographie ferroviaire Canadienne. Caption: The locomotives from train 384 have left the train to lift cars in Aldershot Yard, making unobstructed views of GECX 9461 possible briefly (GE Dash 8-40CW, ex-UP 9461). The leaser was in front while reversing into the yard at Aldershot East, though control of all 4 units remained in original lead unit CN 8830 (GMD SD70M-2). I preferred King Road grade crossing which used to run through the middle of CN Aldershot East, because it gave better access for photography. But no doubt local motorists like the current underpass better, as does CN. It would be nice if more grade separations were by road bridge over the tracks, with sidewalks both sides, reasonable height safety barriers, and no chain link … while we’re at it, less lineside billboards ! The underpass is a good thing. When I lifted or set out at Aldershot the crossing at King Rd was sometimes blocked for close to an hour!